Aviation Operations . :: Hellenic Imperial Airways Virtual ::. Imperial Aviation was created with an aim to provide training for new pilots and pleasure for the more experienced. Based in Megara (LGMG), it schedules small tours to destinations in Greece and neighboring countries, causing the virtual pilot to discover the joy of VFR flights, or test the capabilities of the IFR navigation without the use of electronic amenities such as an FMC. Small airports with difficult approaches such as the Greek islands and combined with short flights. These operations are convenient for obtaining relevant experience for the new virtual pilots. The fleet of Imperial Aviation type aircraft consists of: Cessna, Piper and Beechcraft, single-engine and twin engine, which is able to meet every requirement of the pilot. Imperial Aviation is for the new pilots who will be entering the world of virtual flight, while the more experienced will help them maintain their knowledge and skills. Discover the pleasure of the air, and environment of Greece and neighboring countries through Imperial Aviation. Popular destinations in the Greek islands such as: Syros, Naxos, Paros, Mykonos, Astypalaia, Kastelorizo, Kalymnos, Ikaria, Skiathos, Limnos, Lesvos, Samos, Chios, Zakynthos, Kefalonia, Corfu, as well as destinations in neighboring countries such as Split, Trieste, in Bolzano, Calabria, and Lampedusa are included in the schedule of Imperial Aviation. As or January 2011 LGMG has a new runway, parallel and just north of the old one, used currently as taxiway with its new link taxiways. Runway 08R/26L is the only take off and landing runway operational until the tower is relocated to a new position. Also a new link taxiway (Foxtrot) was constructed parallel to Echo linking the runways with the GA apron. 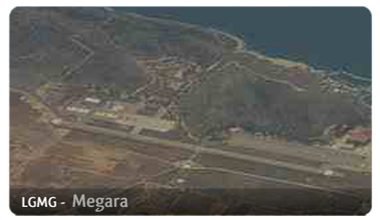 The airport of Megara, a general aviation and air force base in Athens, for aircraft and helicopters. The civilian part of the airport was inaugurated on May 2005. The Hellenic Army General Staff ceded a territory of 100 hectares to facilitate a general aviation airport.